With respect to knowing punctuation rules, understanding when to use a comma and period are generally going to be sufficient to communicate effectively. However, in a way, writing is similar to cooking. If you know how to boil water, you could probably avoid starvation. Meanwhile, you would also miss out on enjoying the wide range of foods and culinary delights available to someone who is able to do more in the kitchen besides boiling water. Thus, understanding the rules of punctuation beyond knowing when to use a comma or period allows for a more enjoyable and informative experience for the reader. This is because punctuation rules tell the reader how to read what is written and show how the writing would sound if spoken. For example, effective punctuation allows the readers to know when someone is yelling, whispering or pausing. Punctuation marks also help compare and contrast ideas in writing. A mastery of the punctuation rules will make it easier to communicate complicated ideas to the readers and allow more effective communication overall. 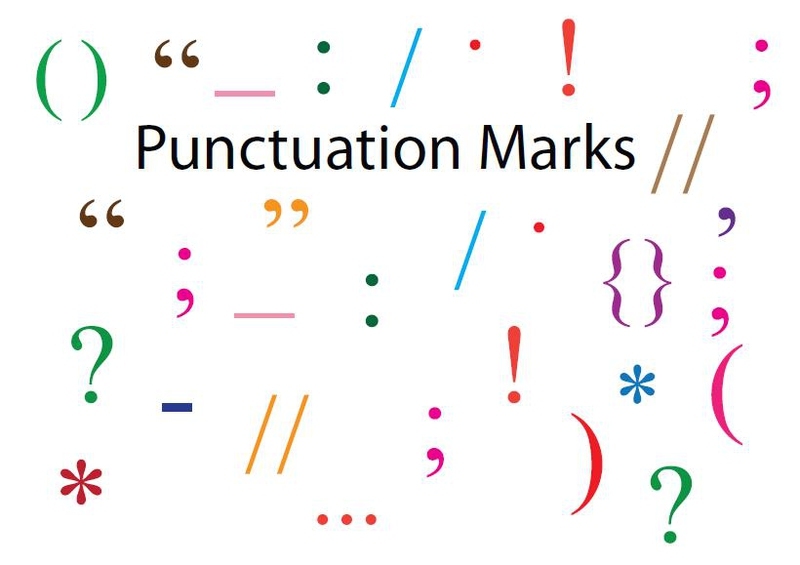 There are about 15 punctuation marks in English. With all these marks, you can show all the feelings and ideas thoroughly in your words. Here, we list the basic rules of 12 more important ones that are commonly used. A comma is a curved shaped line attached to a dot that is usually used to indicate a pause or separate clauses in a sentence. Rule 1: A comma is used to list a series of three or more items. Example: The airplane was loaded with fuel, luggage, and passengers. Rule 2: If a sentence begins with a dependent clause, use a comma after the dependent clause. Example: If you want to try fishing, give me a call. You can also click When to Use a Comma to know more rules of using it. A period is a dot that usually marks the end of a sentence. Rule 1: A period is used at the end of a complete sentence. Example: The cat jumped over the sofa. Rule 2: A period is not needed if the end of sentence already has a period indicating an abbreviation. Example: He works at the firm called Jones, Smith & Day, P.C. A question mark is a curved line with a dot at the bottom, used to signify a question. Rule 1: A question mark is used at the end of a sentence which is a direct question. Rule 2: A question mark can be used when a sentence is a half question and half statement. Example: You can’t read, can you? An exclamation point is a vertical line with a dot at the bottom, which is used to signify surprise or strong feelings. Rule 1: An exclamation point is used at the end of a sentence to show strong feelings, surprise or for added emphasis. Rule 2: When an exclamation point is used, it will replace the period at the end of the sentence. Example (of incorrect usage): He shoots, he scores!. A colon is a pair of dots arranged vertically and is usually used to begin a list. Rule 1: A colon is used to begin a list of items. Example: In order to bake a cake, you will need the following ingredients: eggs, milk, sugar and flour. Rule 2: A colon may be used to follow a salutation in formal correspondence. Example: Dear John: how are you? A semicolon is a period and comma arranged vertically with the period on top and the comma on the bottom. It is often used to separate independent clauses in a sentence. Rule 1: A semicolon can be used in between two sentences, if the two sentences are closely linked. Example: Chores have been completed; I will go play now. Rule 2: A semicolon can be used to list three or more items, but when the items themselves contain commas. and honey; milk; yogurt and pizza. A hyphen is a horizontal line generally used to connect two words together. Rule 1: A hyphen is used to form a compound adjective. Example: The class is taught by a know-it-all teacher. Rule 2: A hyphen can create a compound noun. Example: The criminal was caught by a law-giver. If you want to know all the rules of using hyphen, read How to Use a Hyphen. A dash is a horizontal line, similar to a hyphen, except it is usually used to denote a break in the sentence, similar to a comma or semicolon. Rule 1: Dashes can be used to replace commas. Example: If the plan works – and I doubt it will – we will achieve victory. Rule 2: The clause in between two dashes is usually not part of the sentence’s subject. Example: Mark – and his encyclopedic knowledge – was a great addition to the academic team. Quotation marks are pairs of commas that begin and end a sentence or phrase and serve the traditional purpose of signifying a quotation. Rule 1: A double set of quotation marks at the beginning and the end of the sentence of phrase indicates a quotation. Rule 2: A single set of quotation marks can be used to represent a quotation within a quotation. Parentheses are pairs of curved lines which are often used to provide necessary information that is not part of the main point in a sentence. Rule 1: Use parentheses when providing additional information. Example: The cost of the new car (with all of the extras) is $34,999.95. Rule 2: Periods can go inside the parentheses, but only if the material inside the parentheses constitutes an entire sentence. An apostrophe is an elevated comma, similar to a single quotation mark. It is often used to mark possessives, contractions, and plural. Rule 1: An apostrophe signifies a possessive. Example: The cashier’s wallet was stolen. Rule 2: An apostrophe is used for contractions and is located where the removed letter would have been. Example: You don’t have enough time to finish the exam. Ellipsis is a series of three periods to indicate a portion of the writing is left out or to represent hesitation. Rule 1: Ellipsis can take the place of missing material. Example: The whole office…left work late. Rule 2: Ellipsis can indicate a pause or hesitation.